"It's a relief to me that my name was cleared, that people no longer have to wonder if I would do something like that." "You can't fight a lie. I'm just so glad the truth finally came out because I would never want something like that to be attached to me." "At the end of the day, all the girls throw shade at each other, but to know that people actually plot, behind the scenes, to plant information on people that's completely made up, that's a real problem. It wasn't even for the sake of television; it was for the sake of tearing me down." "The fact that she never once let on that she had anything to do with it, clearly, she just wants to tear down my reputation, kill my fan base, hurt my business. It was really just terrible. And then she's supposed to be friends with Porsha? Then she set her up to be the fall guy? That's a lot of plotting going on. People don't want to deal with that." And in other news...water is wet. I wouldn't either, that hoe is nuts. I think there's more to this story. Knowing all the dirt on Phaedras name and the fact that she's a lawyer; it's pretty stupid for her make up such a lie. Marvin and Kandi have to shut down the dungeon until everything cools down. Marvin loves this sweet Kandi come up. 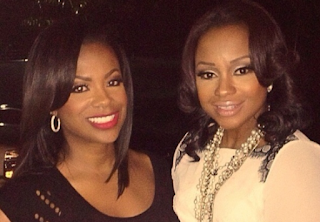 Everyone misses or over looks the most important words Phaedra ever spoke "Kandi was collateral damage". The real target was Porsha. Mysterious: We have a crisis in our country that is more important than this childish nonsense. Grow up!!! Get over it!!! And move the hell on!!! So if they let Phadra go...whats gonna be Kandi and Porsha story line for next season? Without all this mess Phadra put out there non of these females have story lines at all. I am sure NeNe and Kim will come back and stir the pot...but without conflict going on...who is gonna be watching. Everyone watches these shows to see how thirsty these females are for a check. No one cares Kandi, the show is over and Phaedra was fired. Find something else to talk about. @11:15 - Todd's alleged alias when he's out in the streets trolling for chicks.